The Americans With Disabilities Act (ADA) makes provisions so that if you have a disability, you still can gain access to public places and private businesses. Accessible parking is one area that the ADA regulates, giving you the right to file a complaint against a company that doesn't provide accessible parking or a nondisabled individual who parks in accessible spaces. Accessible parking spaces have to be on the shortest accessible path from the parking lot to the entrance of the building. In the case of community parking lots that don't belong to a particular building, the accessible spaces should be on the shortest route to an accessible pedestrian exit of the parking lot. One of every 25 parking spots in a parking lot has to be accessible. In addition, one of every eight accessible parking spaces in a parking lot has to be van accessible with enough space to unload a wheelchair ramp. If your business is only required to have one accessible parking space, it has to be van accessible. Accessible parking spaces have to be at least 96 inches wide with an aisle that connects to an accessible route to the building it serves or to an accessible pedestrian path if the lot doesn't belong to a building. Two accessible parking spaces may share the same aisle. The international symbol of accessibility (white wheelchair and user on a blue background) must mark every accessible parking space. The sign should be posted high enough so that no parked vehicles will block it. To obtain an accessible-parking tag, a doctor has to certify that you have a qualifying impairment. You must then take the medical information to the Department of Motor Vehicles and follow its additional instructions to apply for your parking tag. Watkins, Emma. "American With Disabilities Handicap Parking Requirements." 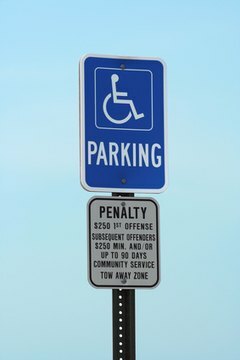 , https://legalbeagle.com/5992684-american-disabilities-handicap-parking-requirements.html. Accessed 22 April 2019.